Great un-scented lotion. Ordered it because I work in an office that does not allow perfumes/colognes. Spreads nicely, non-greasy, absorbs quickly, leaves skin smooth and soft. Very nice! Beautiful lotion!! I keep it in my purse to take to work. It keeps my hands feeling soft without feeling greasy. This hand and body lotion is creamy without leaving you feeling greasy. It is free of toxins that we don't want on our body. Great product. This is our favourite and "go-to" lotion. I am sensitive to smell and although this has a very light scent, it does not bother me. Lotion is non-greasy and absorbs quickly. This lotion is fantastic. It has no unpleasant "unscented smell" that you sometimes get with unscented products. It's not greasy at all, absorbs right away so I even use it on my face. Love it. Nourishing, non-greasy and no scent. Perfect if you need skin moisture but do not want any fragrance because you have pets, or you plan to spend some time in nature or be around bees. I have very sensitive skin, so it is nice to be able to get an unscented product, although there is a faint fragrance that disappears quickly. 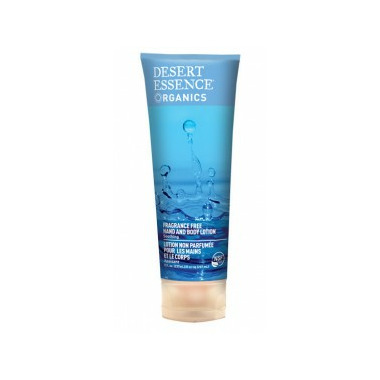 I am a fan of the Desert Essence products and this lotion is no exception. My skin seems to be happy with it. My husband's favourite. He says it works better than the coconut one. Feels good on my skin, not greasy. Very faint fragrance, which is all natural and lovely. I have recently purchased this product and am very pleased with the results. It is a really nice, fragrance free lotion and my skin feels well moisturized. I will continue using this product. If you're looking for a great unfragranced lotiion, this is it. Absorbs well into the skin and not greasy at all. Highly recommend this product! great lotion with healthy ingredients and no fragrance...goes on thick but absorbs well...will continue to use this lotion! Really love this. Moisturizers well and really is fragrance free. Does not aggrevate sensitive skin. Will buy again! love this lotion for my hands...especially in the winter months. love the healthy ingredient list and that it is fragrance-free...great product! Love it! Was looking for a hand cream that was safe for my baby in case he happened to put my fingers in his mouth. I'm a hand cream freak and this is one of the best hand creams I've tried. Super hydrating and smells like almost nothing. I love this lotion for everyday use, I love fragrances but this lotion allows me to use any of my favourites while layering! I will continue to buy this one!!!! Does exactly what it says it will. I like that it's not greasy and has no parabens. It says that it's unscented but I pick up a fresh smell from it. Nothing bad and disappears quickly though. Fragrance free, non greasy, natural, as advertised! Great lotion bought for use on body hands and even my super dry face after had our first baby and was trying to avoid scented products. Great absorbency and love the actual no smell of this product! wonderful moisturizer. nice and thick but absorbs quickly and leaves my skin nice and soft. I use this as a hand cream. I keep it beside my bed and apply it at night. It is nice and thick and absorbs quickly. This is a nice cream that goes on thick but absorbs well. It's not greasy and it doesn't smell funny like some other fragrance free lotions do. It moisturizes well, but it's only summer right now and I have a feeling I'll need some more extreme moisture for my super dry and chapped winter skin. I like that this cream is safe for the whole family and sensitive skin. I would definitely buy it again. Our boys use this product all the time and with no scent it is a winner for them. I love this product, it's the perfect thickness for a hand and body lotion, it carried me through the dry Canadian winter, and it's got a great score on EWG Skin Deep. The fact that there's NO Parabens, SLS, and all that bad stuff was what sold me on it. I love the fact that water is not one of the very first ingredients unlike every other moisturizer I've used. Water is one of the very last ingredients. It's super creamy and takes a while to rub in but it is so worth it to be putting something on my skin that doesn't contain any junk. This is my favorite hand cream. It works very well to moisturise my frequently dry hands. My skin bubbles if I use any cream with wheat or gluten in it, so the gluten/wheat free guarantee on the back is wonderful. It is also completely unscented so I can use it around friends and coworkers who are either allergic to perfume or just don't like strong scents. Great lotion. It's thick and NO harmful chemicals. Great for pregnant bellies!